Rainbow Six Siege’s Canadian trap specialist Frost is getting a new elite skin, and in it she’s decked out as a rugged, go-it-alone trapper equipped for long treks through the Yukon. Frost’s new skin was revealed at the end of a panel discussion by the Rainbow Six Siege team during the Six Majors tournament in Paris today, following an in-depth look at some of the other changes coming along with Operation Grim Sky. The elite skin has Frost a fur-lined parka with rough stitching and polygonal camouflage. Over it, she’s wearing an old-school military pistol belt, which reflects her service in the Royal Canadian Air Force. A pouch on the chest strap is emblazoned with a Canadian flag patch, and on her hands she’s wearing a pair of rough-duty trapper’s gloves. Frost isn’t wearing any headgear or face covering in her new elite skin, and her hair is braided back in four loose rows. 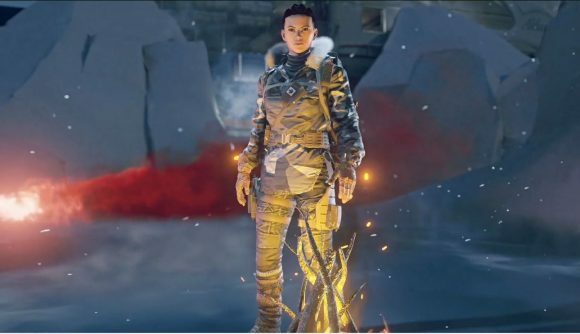 The trapper theme is an appropriate one for Frost, a defender who can place her ‘Welcome Mat’ snares to instantly down attackers who aren’t watching their step. She grew up in British Columbia, which has some of the most beautiful and untamed wild country in North America. Frost’s new elite skin will be available (they run 1800 R6 credits for the set) when Operation Grim Sky launches in September.